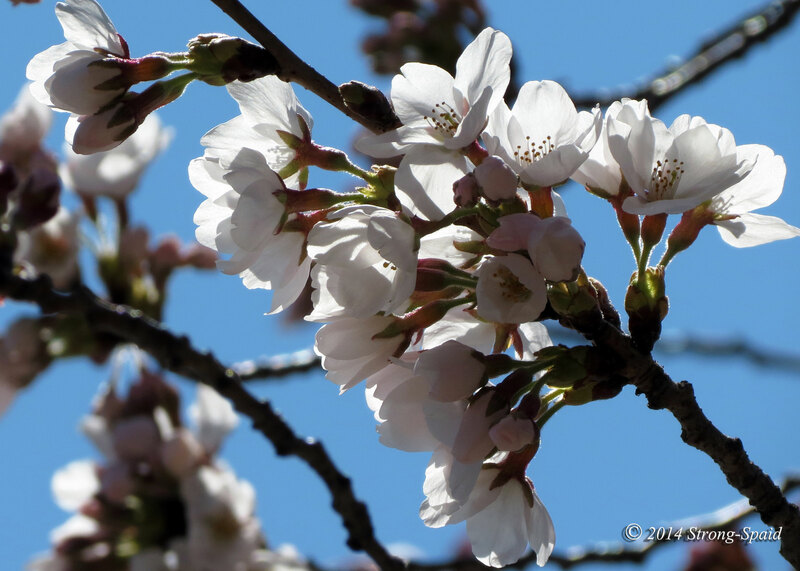 In 1912, the cherry trees that are now growing around the Tidal Basin in Washington, D.C., were given to the United States as a gift of friendship from Japan. 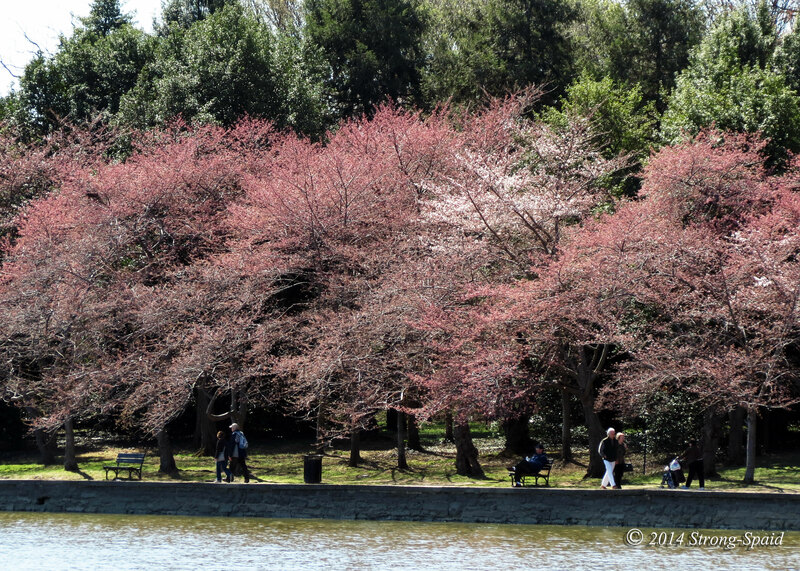 As time went by, the beauty of these trees in the spring began to attract visitors from all around the world. I took these photos on a rather chilly Sunday morning (April 6), and I wasn’t surprised to find that the trees were not in full blossom yet. 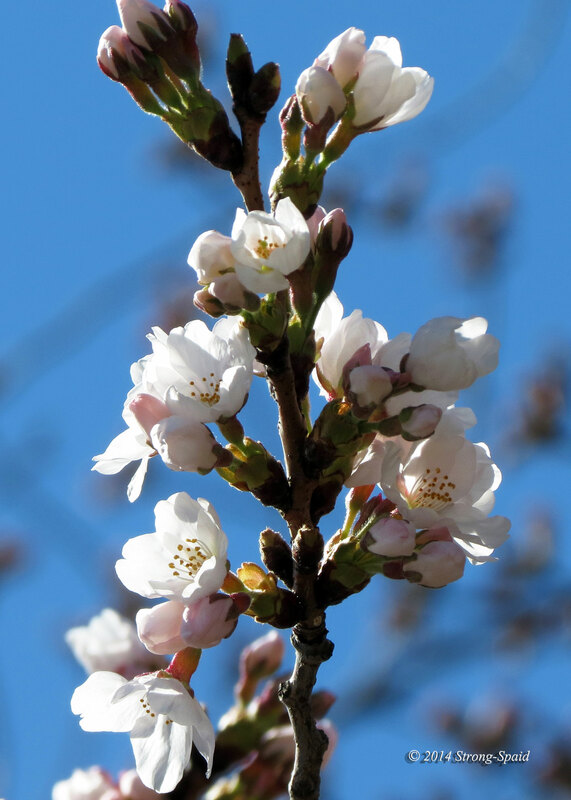 Although the Cherry Blossom Festival is being held from March 29 through April 12 this year, the trees are blooming later because of the cold, harsh winter that extended into late March. As I walked along, I heard some people say how happy they were because it was not as crowded due to the cooler weather. It was easy to find an open bench! What a joy to be able to relax, look out over the water, and listen to the gentle breeze blowing through the trees. The truth is, even though the trees were not in full bloom, there were actually quite a few cherry blossoms to see—it just took a little time to find them. 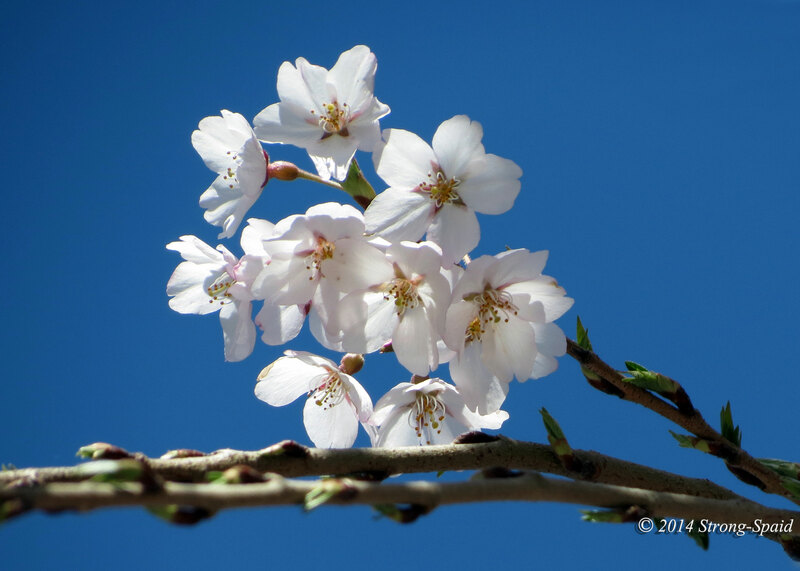 This entry was posted in Haiku, Japan, Nature, Photo Essay, photography and tagged Cherry Blossom Festival, flowers, Spring, trees, Washington D.C.. Bookmark the permalink. True! These cherry trees were gifts from Japan a little over 100 years ago now. They most certainly have made Washington, D.C., a more beautiful place! Now, that’s a great gift!! Thanks Alison and Don…and all of this is only about an hour from my house! Nice pictures! Thank you for sharing. In 2010 I came to Washington DC to see this lovely blossom but it was a little bit too late and I missed that event. The ways of nature are very hard to predict. So, it is very difficult to determine exactly when is the best time to come. Sometimes rain and wind blow the cherry blossoms away as soon as they bloom! That is exactly what happened in my case. I live beside of the park where we have about 10 Japanese cherry trees. It is not the same like in Washington. Nevertheless blossom looks gorgeous. Hope to see it again this spring. I haven’t seen any posts from you in my reader, but I know you must have posted a few photos of spring in Montana. I’d like to see them some day. Beautiful. 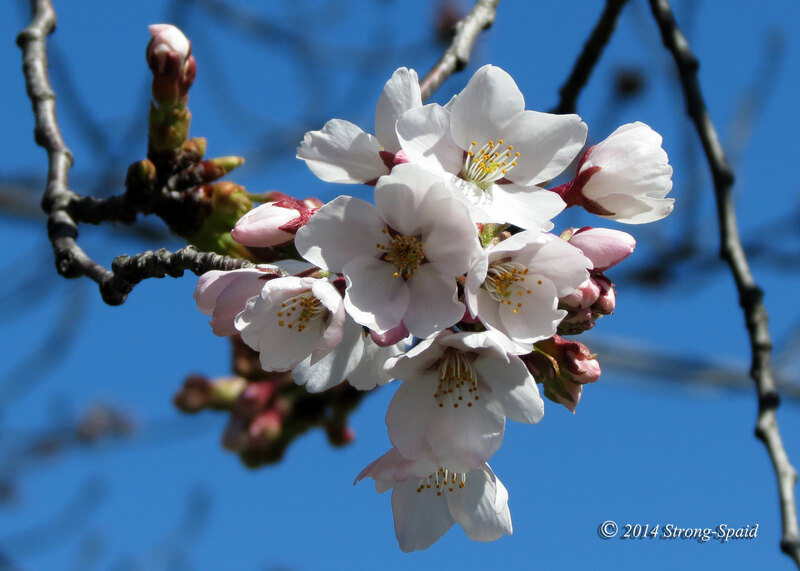 little hard to predict when the cherry trees will blossom because it all depends on the weather…. but they are definitely worth coming to see. Mary, I found myself revisiting this post. 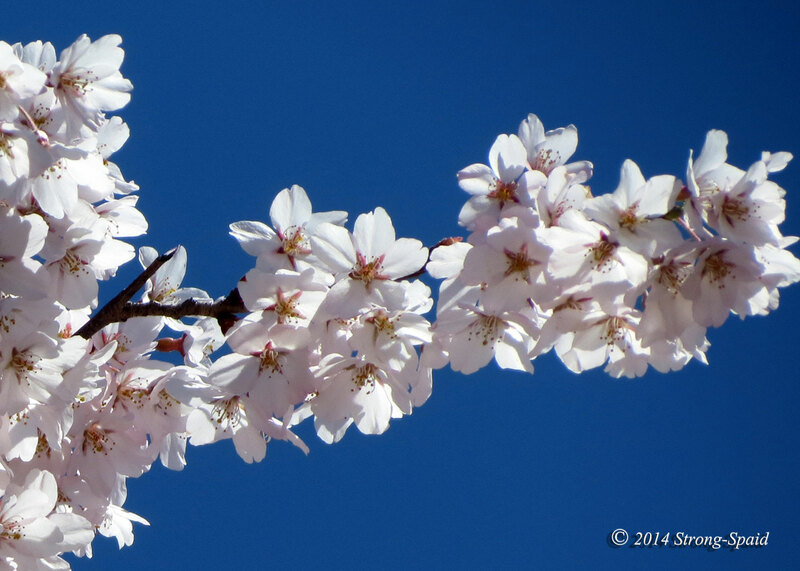 I used to live in the D.C. Metro area and spring blossoms were a favorite event during the year. So much beauty. You capture this well! Thanks. It is rather amazing to find such calm natural beauty–in the middle of a busy city! Beautiful! 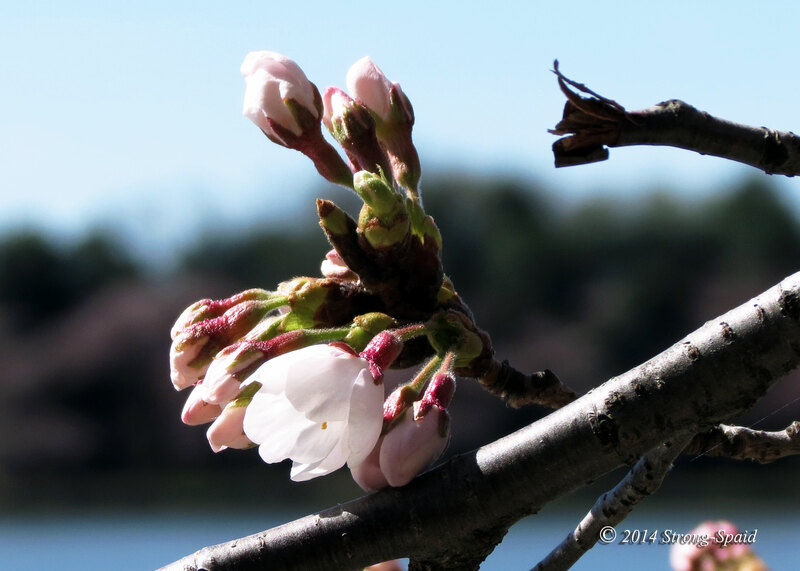 Seeing the early emerging blossoms was seeing Spring struggling to arrive. Thanks! The cherry blossoms were late coming out here too because of the unusually long, cold winter. But now….spring is most definitely here! Absolutely wonderful! I have never been there but would love to go. We had those troubles last year. This year we only had two weeks of winter – far too little! To be in DC during the height of Cherry Blossoms is on my list of things to do. Went to Macon, GA last year for their Cherry Blossom Festival — but nary a one in sight because of the cooler weather in the area last year. Beautiful shots! 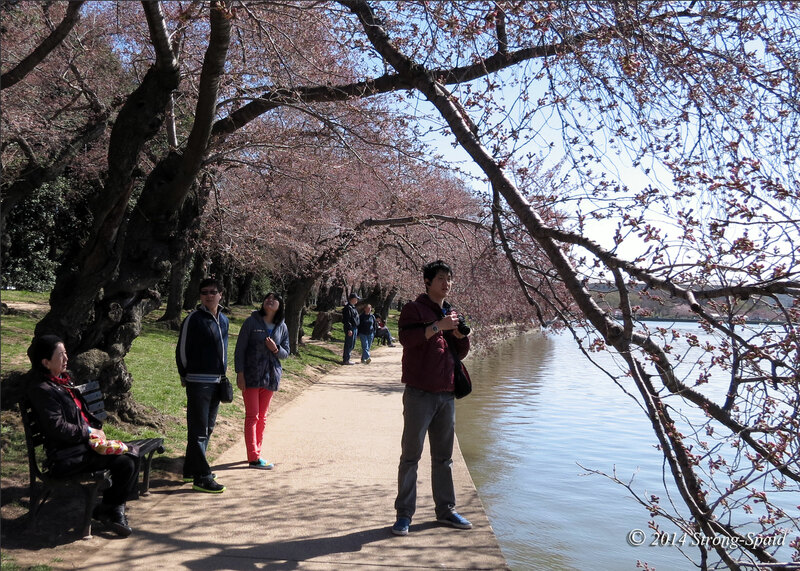 The cherry trees in DC didn’t come into full bloom until around April 10 this year…..which is rather late. Most years they are blooming much earlier, but it was a harsh cold winter. It’s kind of hard to predict what Mother Nature will do! Lovely pictures–What a beautiful time of year in DC! Yes it is! Spring is wonderful. Mary, I hadn’t seen any posts from you in my reader, and just realized I never clicked the “follow” button on your blog! Arrgh. My bad. I love this post on the cherry blossoms. My husband and I went down last weekend and the crowds were unbelievable. We were expecting that, given the beautiful weather, and having the opportunity to photograph the blossoms in full bloom was well worth the less-than-peaceful atmosphere. I love your photos, especially the close ups. Gorgeous! Such beautiful, delicate flowers deserve to be seen in detail. Just like Charlie Brown 😀 And, yes, I did post some photos from our trip into the melee! I have planted a weeping cherry from a sprouting an elderly woman gave me. She has since died and I am babying this little tree. I hope it looks like your pictures one day. Nature is unpredictable, that’s for sure. We do our best! We planted a small Red Japanese Maple in our front yard, about 10 years ago. It has grown and is quite beautiful. However, every spring, we hold our breath and keep our fingers crossed. If the leaves sprout and freezing weather returns for a day or two in the spring, it will quickly kill the tree. My favourite tree, the Cherry blossom , nice photos ! These blossoms look very much like our apricot bossoms. Gorgeous! Thank you! 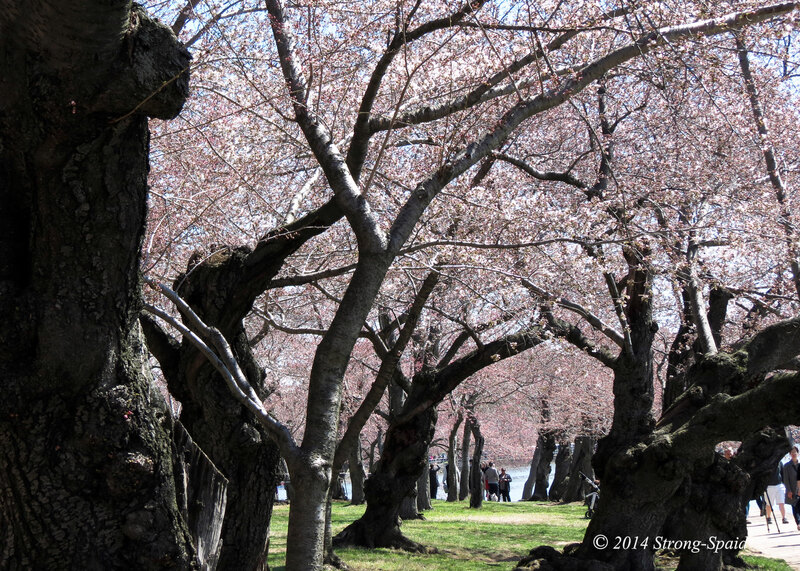 Many people come to Washington D.C., from all around the world, to see these cherry trees every year. It’s quite a sight to see.